Basil II, called “Bulgar-Slayer” (Bulgaroktonos), he reigned from 976-1025 as the greatest of the Macedonian emperors. This was not apparent at the beginning of his long reign. His first military expedition (in 986) against Samuel of Bulgaria, ended in total defeat at a narrow pass called Trajan’s Gate. This encouraged two rebellions, those of Bardas Skleros and Bardas Phokas. The latter became the military aristocracy, the so-called dynatoi, of Asia Minor in the 10th century, powerful families that produced the likes of Bardas Skleros, Andronikos Doukas, and Bardas Phokas. The ability of these families to foment rebellion brought Basil II into armed conflict with them. After Basil II’s death in 1025, a struggle ensued between the military aristocracy and the civil aristocracy (which comprised the state bureaucracy). Basil became effective ruler only in 976, on the death from typhoid fever of John I. But he was still very young, and there were members of the aristocracy related to the previous emperors, Nikephoros Phokas and John Tzimiskes, who felt that they had better claims to imperial power. Both Nikephoros and John had, in effect, seized the throne, and had been able to legitimate their position only through marriage to the widow of emperor Romanos II – father of Basil and his brother Constantine – who had died in 963. It was a leading member of one of these ambitious noble clans, Bardas Skleros, who rebelled against Basil II shortly after his succession in 976; and it was another leader of an even more prestigious family, Bardas Phokas, whom the emperor called to his assistance in 978. The rebellion was defeated and Skleros escaped to the Caliphate where he was imprisoned. On his release in 987, however, and with Arab support, he returned and raised an army once more. Bardas Phokas was sent against him, but betrayed the emperor, first coming to an agreement with Skleros, then imprisoning him and declaring against Basil II himself. In 988, Basil was in desperate need of effective soldiers and was on the brink of losing his throne. Although of peerless lineage – he claimed descent from Constantine the Great – the thirty-year old Basil II was facing a massive revolt by Bardas Phokas, one of the empire’s most capable generals. Although he would eventually emerge as one of the empire’s most ferocious warriors, in 988 he was still new on the throne with an unreliable army and a skeptical court. The rebel general marched through Asia Minor unopposed, sacking any town that displayed loyalty to the emperor. When he reached the shore of the Bosporus, the narrow strip of water that separates Asia from Europe, he had himself crowned emperor, complete with imitation diadem and the purple boots of the imperium. The population, sensing the way the wind was blowing, hurried to offer their congratulations and support. By one account, the rebel army was now twice the size it had been when it set out. Basil, whose one previous military campaign had ended in an ambush, had only the few troops in Constantinople and a nearby field army of questionable loyalty. Things looked bleak, but the emperor kept his head. Even before the rebel army had reached the shore, his ambassadors were speeding towards Kiev. Prince Vladimir, was only too happy to receive them, and he made an audacious offer. In exchange for six thousand Viking recruits from Scandinavia, he wanted to marry Basil’s sister, Anna. The ambassadors probably returned to Constantinople believing that they had failed. In the long history of the empire, a princess of the ruling dynasty had never been given to a barbarian. The proposition itself threw the court into an uproar. Not only was Vladimir a barbarian, but he was a staunch pagan to boot, who had slaughtered his own brother, raped his sister-in-law, and usurped the throne. He already had seven wives and over the years had collected some eight hundred concubines. Even in an emergency, he was not the type to be given a chaste Christian princess. The court – and poor Basil’s sister – may have been outraged, but the emperor was determined to have the extra troops. He agreed to the deal, adding only the stipulation that Vladimir had to accept Christianity and give up some of his more scandalous behavior. Both sides were as good as their word. Vladimir was baptized, the protesting bride was shipped north, and six thousand hulking Vikings arrived at Constantinople. Basil wasted no time. In 989 under the cover of darkness he slipped across the thin strip of water separating him from the rebel army, and landed a few hundred yards from the main enemy camp. At first light he charged, driving them toward the beaches. The rebels didn’t stand a chance. Stumbling out of their tents half awake and undressed, they were confronted with a horde of screaming Vikings, swinging their massive battle-axes. So many were slaughtered that before long the Vikings were doing their work ankle-deep in gore. Those who managed to escape the carnage had the equally horrid fate of being burned alive. As they fled the ruins of their camp to the water’s edge, a squadron of imperial ships blanketed the beach with Greek Fire, immolating everyone. And although Skleros continued in rebellion for a while, a reconciliation was soon arranged and peace restored. The victory both secured Basil on his throne, and convinced him – if there were any remaining doubts – that he had been right to sacrifice his sister. Another man would have thanked his mercenaries, paid them off, and dismissed them, but Basil had other ideas. The years of turmoil had convinced him of the necessity of overhauling the Byzantine army, and he intended to use these Vikings as a new core around which to build it. 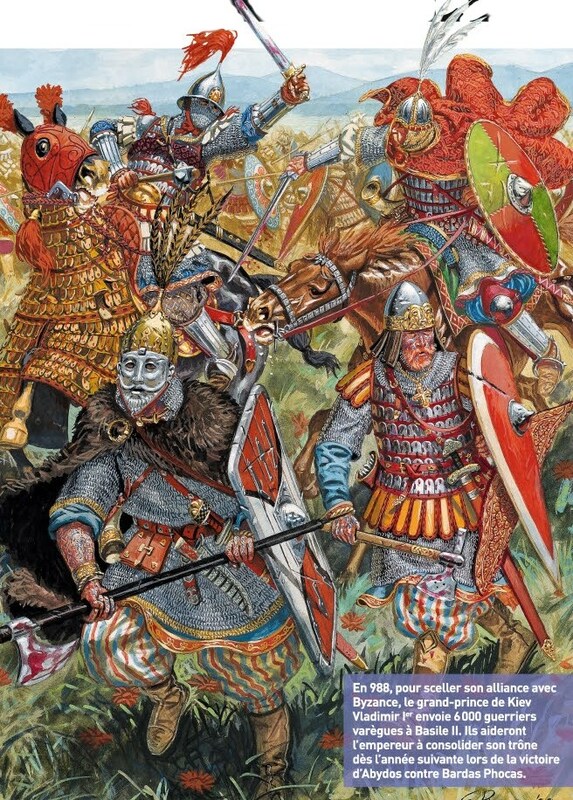 Only with the help of 6,000 Varangians sent by Vladimir I of Kiev were the revolts suppressed. In return, Basil gave his sister Anna to Vladimir in marriage, requiring that he convert and be baptized, which he did. Basil II tried to curb the expansion of the landed estates of great landowners (including monasteries), the dynatoi, in an effort to preserve peasant land, especially military holdings. Among his decrees (the first in 996) was one forcing the great magnates to pay the unpaid taxes (allelengyon) of their poorer neighbors. Basil further reduced the power of the provincial armies, the themes (q. v.), which the military magnates controlled, by commuting army service into a money payment. The revenues he used to create a standing army, the elite forces of which were his Varangian Guard. With such troops, Basil II set out to subjugate the Bulgars while at the same time defending Antioch and Aleppo in Syria. 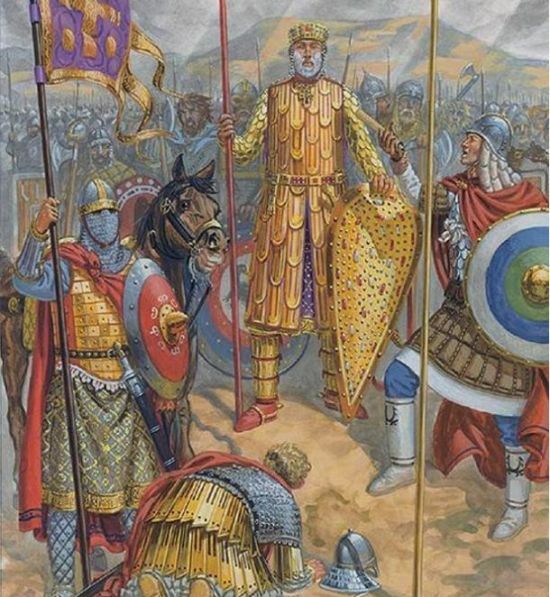 Basil II flanked by his royal guards. The Varangian Guard, an elite unit of the Byzantine Army in the 10th to the 14th centuries, was one of the most famous mercenary corps of history and was certainly the most famous of all the Byzantine regiments. It is thought that the term “Varangian” comes from an archaic Norse word variously translated as “conﬁdence,” “vow of ﬁdelity,” or “ally,” and refers to a group of warriors and traders who had sworn allegiance to their leader and fellowship to each other. Interestingly, what is now the Baltic Sea was in earlier times known as the Varangian Sea. The ﬁrst clear glimpse of them comes in 988, when the Emperor Basil II (978–1025) asked Vladimir I of Kiev for military assistance to help defend his throne. Vladimir sent 6,000 warriors, known as “Rus,” to the Emperor. The word “Rus” may have come from an Old Norse term meaning “the men who row.” They were such excellent ﬁghters that they soon became the Emperor’s personal bodyguard. Under Basil II, the Byzantine Empire built up a largely mercenary army, generally abandoning the earlier system under which territorial forces defended the provinces and regulars from Constantinople reinforced them when needed. Because Basil II regarded mercenaries as politically more dependable than regular troops, his reliance on them would persist for a long time. The Varangian Guard greatly proﬁted from his support and was paid very well indeed. This entry was posted in Armies, Byzantine by MSW. Bookmark the permalink.